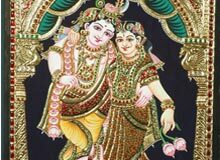 Tanjore Painting is one of the most popular forms of classical South Indian painting. It is the native art form of Thanjavur (also known as Tanjore) city of Tamil Nadu. The dense composition, surface richness and vibrant colors of Indian Thanjavur Paintings distinguish them from the other types of paintings. Then, there are embellishments of semi-precious stones, pearls and glass pieces that further add to their appeal. The relief work gives them a three dimensional effect. Tanjore Painting of India originated during the 16th century, under the reign of the Cholas. Maratha princes, Nayakas, Rajus communities of Tanjore and Trichi and Naidus of Madurai also patronized Indian Thanjavur Paintings from 16th to 18th century. Most of these paintings revolve around the theme of Hindu Gods and Goddesses, along with saints. The main figure is always painted at the center of the painting. Since Tanjore paintings are mainly done on solid wood planks, they are locally known as 'Palagai Padam' (palagai meaning wooden plank and padam meaning picture). Of the numerous steps involved in the making of a Tanjore Painting, the first involves drawing of the preliminary sketch of the image on the base. The base is made up of a cloth, which is pasted over a wooden base. The second step consists of mixing chalk powder or zinc oxide with water-soluble adhesive and applying it on the base. Thereafter, the drawing is made and ornamented with cut glass, pearls and even semi-precious stones. Laces or threads may also be used to decorate the painting. To further augment the effect, wafer thin sheets of gold are pasted in relief on some parts of the painting, while the other parts are painted in bright colors.